In order to understand how teachers implement Everyday Mathematics , it is important to become familiar with the different components, or elements, of EM. Over 40 different components comprise EM, including specific materials, activities, lesson content, lesson organization, tools, and teaching strategies. The EM Component Framework clearly defines each EM component and provides examples of each component across different grade levels and EM editions (3rd Edition and 4th Edition). The framework categorizes similar components into groups, making it easier to compare components and recognize the different ways in which EM may be related to learning. Because Everyday Mathematics has so many components, the question of “How are teachers in my school or district using the program?” cannot be answered with a single number or score. Rather, by collecting data on how teachers use specific EM components individually or in combination, school and district leaders can identify patterns of use and pinpoint which components teachers use most and least frequently. The Teacher Instructional Questionnaire for Everyday Mathematics (TIQ-EM) is a 30-minute survey that asks teachers to report their use of each EM component within their most recently completed instructional unit, providing a unit-specific Component Profile. The Component Profile is intended for descriptive, rather than evaluative, purposes. When combined with data collected about the reasons behind teachers’ EM implementation, the school or district Component Profile can help inform the design of teachers’ professional learning opportunities. Please fill the form below to access the TIQ-EM and the EM Component Profile Report Template. The resources in this section are for K-12 district and school leaders, researchers, and others interested in understanding how teachers in a particular setting are implementing Everyday Mathematics . 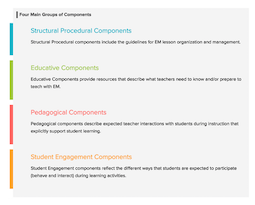 The EM components are organized into four main groups: Structural Procedural Components, Educative Components, Pedagogical Components, and Student Engagement Components. A 30-minute survey that asks teachers to report their use of each EM component within their most recently completed instructional unit, providing a unit-specific Component Profile. Are you interested in measuring implementation of Everyday Mathematics in your school or district, but not sure where to start? Outlier Research & Evaluation offers a range of services to support questionnaire administration, technical support, data analysis, and data reporting. For more information, visit Outlier’s Implementation Measurement Services page or contact Amy Cassata at acassata@uchicago.edu.